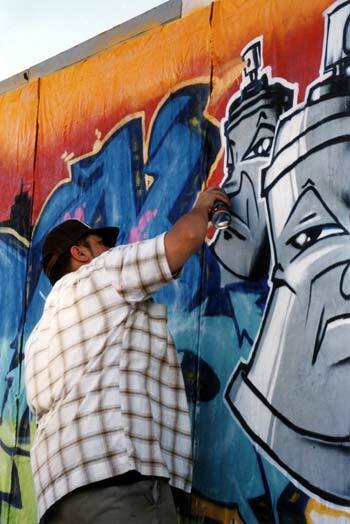 Graffiti art, which emerged in New York in the 1970s, became associated with the explosion of hip hop culture in the 1980s. Inevitably it surfaced in New Zealand, where Māori and Pacific influences gave it a local edge. Graffiti artist Juse 1 is shown painting a wall at Waitangi Park in Wellington. He and his friends have done commercial designs for clothing, posters and tattoos, and have exhibited their work at the Dowse Art Museum in Lower Hutt.